Hello LosAngeles - Eat Your Veggies - In Your Pasta! Eat Your Veggies - In Your Pasta! 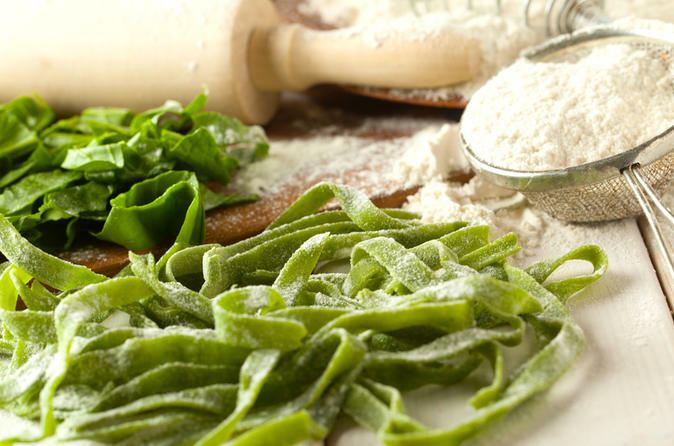 If you love fresh pasta and want to eat more veggies, this hands-on cooking class is for you. We'll make gnocchi, ravioli, and fettuccine, all of which will feature a colorful vegetable such as spinach, beets, or squash. You'll learn to make, roll out, and shape the dough for these three very different pastas, plus participate in preparing the sauce for each so you can recreate these dishes at home. After the cooking is done, we'll sit for a pasta-lover's feast, accompanied by a refreshing green salad to cleanse the palate. Sunday, May 13th, 2 pm - CLASS FULL! Radical Cooks founder Nina Zippay’s passion for sustainable cuisine evolved at age seventeen. When her father became seriously ill he was forced to cut out much of what constituted his regular diet. She took it upon herself to rehabilitate her family’s diet reducing salt, fat, and sugars. She began cooking seasonally and from the source. Such practices helped not only extend her father’s life but transformed her life in the process. Her greatest inspiration now comes from her own children from whom she derives her passion for delicious and healthy meals and the importance of giving it careful and loving preparation. Cooking with local, seasonal ingredients is something we all aspire to. It celebrates where you live, allows you to meet your farmers at the market, and helps you eat a wider range of fruits and vegetables. According to traditional Chinese medicine philosophies, by imbibing seasonal foods consistent with the external environment we remain in harmony with nature, adapt better to changes, and stay healthy. But how to start? And how to sustain? At Radical Cooks we believe all change begins at the root.